President Trump and Senate Majority Mitch McConnell held a joint news conference Monday in the White House’s Rose Garden. WASHINGTON — President Trump and Senate majority leader Mitch McConnell sought to project unity Monday amid heightening tensions between the president and Senate Republicans that have complicated the legislative agenda and raised doubts about whether a tax overhaul can be done this year. 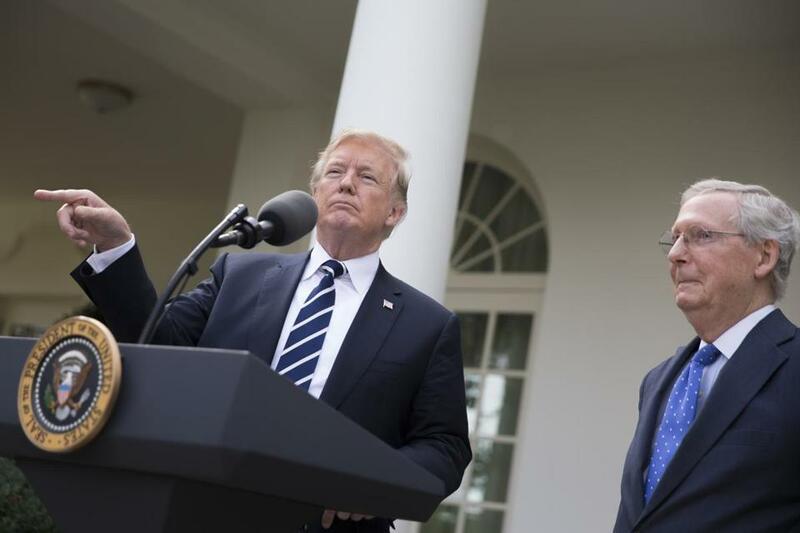 At a joint news conference in the White House Rose Garden after a working lunch, Trump and McConnell tried to dismiss media reports of their troubled relationship and to demonstrate that they are on the same page on the effort to rewrite the nation’s tax laws. ‘‘We have the same agenda,’’ the majority leader said. However, while Trump and McConnell both said they are aiming to complete a sweeping revision of the tax laws by the end of this year, they left open the possibility it might not happen until 2018. Trump noted that the last major tax overhaul was adopted in 1986, midway through President Reagan’s second term. “I’ve been here a little more than nine months,” he said. In a surprise comment, the president said he plans to release an economic development bill but that he has not yet briefed the Senate leader on it. The lengthy public appearance before reporters veered into many other topics as well, as Trump fielded questions on health care, the investigation into Russian election meddling, reported attacks on Americans in Cuba, his nominee for drug czar, and past sexual allegations against the president. ‘‘There has been absolutely no collusion,’’ the president added. Trump said he believes Cuba is responsible for unexplained illnesses that have sickened American government workers in the island nation. It wasn’t clear whether Trump meant Cuba was behind the attacks or merely shared responsibility because it failed to keep Americans safe on its soil. The United States has avoided casting blame on President Raul Castro’s government for the illnesses, which began last year. Trump said he will ‘‘look into’’ his nominee for drug czar, Representative Tom Marino of Pennsylvania, after a report about his role in passing a bill weakening the Drug Enforcement Administration’s authority to stop drug companies from distributing opioids. The Washington Post and CBS’s ‘‘60 Minutes’’ reported Sunday on the 2016 law and Marino’s role in it. One uncomfortable element of the dynamic between McConnell and Trump continued to loom over the two men, even after their news conference ended: the actions of Stephen Bannon, Trump’s former chief strategist. Bannon is waging an effort to unseat Republican senators loyal to the majority leader in the midterm elections by backing primary challengers. Trump said Monday that he has a ‘‘very good relationship’’ with Bannon. At the same time, he hinted he might try to persuade Bannon not to take on certain GOP senators. “I’m going to see if we talk him out of that, because frankly they’re great people,’’ Trump said. He did not specify whom he had in mind. McConnell explained that his midterm goal is simply to keep Republicans in control of the Senate majority. Trump also said he plans to meet next week with Roy Moore, the controversial Republican Senate nominee in Alabama who defeated the candidate endorsed by both McConnell and Trump. Moore visited Capitol Hill earlier this month but did not meet with McConnell or Trump. Bannon championed Moore during the primary. The president singled out Senator John McCain, Republican of Arizona, who cast a decisive vote in the summer against a Republican plan to repeal and replace the Affordable Care Act. During a Cabinet meeting earlier Monday, Trump predicted that there ‘‘will soon be a short-term fix’’ to the federal health law, now that he has curtailed subsidies under the ACA. He went on to say that if the move to fix the law failed, Democrats would get the blame. After Senate Republicans failed to dismantle the ACA, the relationship between Trump and McConnell worsened. The president took to blaming the majority leader for the failure. Trump’s feud with Senator Bob Corker, Republican of Tennessee and the chairman of the Foreign Relations Committee, has also rattled his relationship with Republicans. The Senate returned to session Monday after its Columbus Day holiday recess. It voted, 70 to 23, to confirm the nomination of Callista Gingrich, wife of former House speaker Newt Gingrich, as ambassador to the Vatican. She worked for the House Committee on Agriculture as chief clerk until 2007. She was a key figure in her husband’s 2012 presidential bid.